Have you noticed how excellent Google has become at handing you the exact information you’re seeking with no need to ever click past the initial search results? Are you in an unfamiliar town and hungry for pizza? Just ask Google on your smart phone and you will instantly find the closest Pizza Hut with directions, a phone number, and hours of operation. How does Google know that information? The business tells them! What about your library? Does Google know your hours and exact location? Is the photo it brings up a good one? If not, you can fix it! And it’s important to do so because it is the first impression many people have of your library. 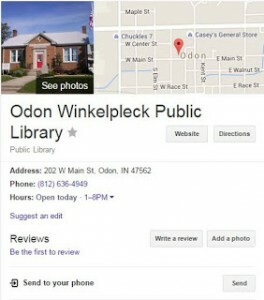 When Google first added a photo for the Odon Winkelpleck Public Library, it was taken from the state highway a block away. It would have shown the back wall of the library if not for the buildings in between. Instead, it showed the top of an in-ground garage. By clicking on “Is this your business?” I was able to customize the results to show the front of the library, add our hours, and correct the spelling for “Winkelpleck”. I have since become an unofficial Google advocate, encouraging every business or organization I know to claim and customize their Google search result. It’s free “top of the page” publicity! And not only free, it’s also good publicity if you take the time to customize it. In fact, I was recently annoyed by a business that paid to promote their own web page to the top of the search results. That page was all about how great their product was. But I was already sold on their product. What I was seeking was a quickly accessible map link for their location. How was I going to buy their product if I couldn’t see the Google results with their hours and location so I could visit them while they were open? What comes up when you search for your library in Google? Every day someone discovers the answer to that question. You too should know the answer! During these latter years of my tenure as library director I tried to do a Google search at least once a month to see the top hits. It was a huge relief when Google offered the ability to correct and customize our Google result page. I encourage every organization to take advantage of that offer. One more note: I have run across a few businesses/organizations that Google has confused with other entities with a similar name. If your organization doesn’t have a customized Google result, you can request one at http://google.com/lbc.